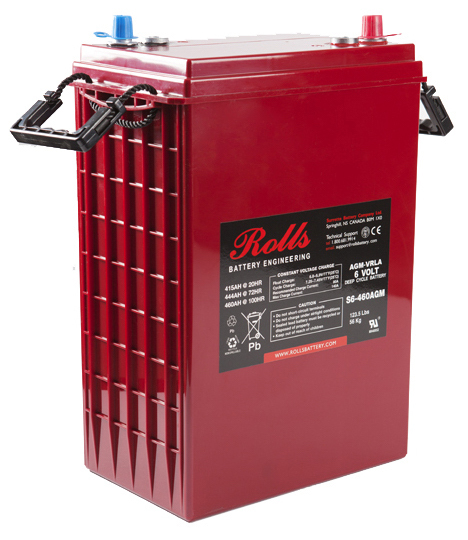 The Rolls Surrette S6-460AGM (S6460AGM) Deep Cycle Battery features a high cycle life without the need for maintenance. The AGM technology (Absorbed Glass-Mat) keeps the electrolyte (Acid) contained in the glass mats allowing the S6-460AGM (S6460AGM) to not expel any liquids even under severe overcharge. The S6-460AGM (S6460AGM) is a non-hazardous battery resulting in lower shipping costs and can also be shipped via air. AGM batteries have an extremely low internal resistance giving them a very low self-discharge rate.